Hello Readers! Storage problems seem to be the theme of my life since returning from my camping trip. The site I previously used for hosting thumbnails decided to cut hotlinking without reasonable warning last week, so those images have all been migrated to my BYOND member space, to which uploading has been made feasible thanks to the new bulk upload design. Last night, three hours and 5 attempts were made to clone my slowly but inevitably failing hard drive. Then this morning at work, I ran into an error at login about insufficient storage to complete Windows startup... which I'm hoping is a one-off issue! Then there is the matter of actually putting away my camping equipment... Regardless, let's check out what developer's have in store! Dragonpearl123 has begun a BYOND fundraising competition, challenging those looking to support BYOND financially by offering an undisclosed and exclusive prize. The contest ends this Sunday! BYOND development has been scattered all across the map these past two weeks, with groundwork, bug fixes, and brainstorming all being mentioned in Lummox JR's weekly development news. Features being worked on for 512 include an upgrade to the .dmm map saving format which should reduce minor changes causing major refactoring, new screen_loc references for the client's viewport, and layer sorting is being reviewed for improvements that may eliminate the infamous flicker effect. Kumorii has pulled together the last months worth of development that has been taking place with Feed. Dozens of changes, features, and bug fixes are mentioned. Portals teleport any object tossed inside, not just players, fire flickers and can be extinguished by rainfall, political plays are in, smoke is thicker and lasts longer, blood effects are enhanced, and the much awaited giraffes are running amuck, just to name a few. Then check out the video demonstration by Maximus_Alex2003 to experience the full effect. YURIRAMOS keeps progress coming in his survival game. Players look to the stars for their path in life, armed with an axe, chopped trees fall and roll, angering the occasional monkey and cactuses don't stand a chance either. Yut Put has added a single player mode to Topdown Showdown, formerly known as Melee for the Holy Grail! The new story mode features 30 levels and four bonus stages. 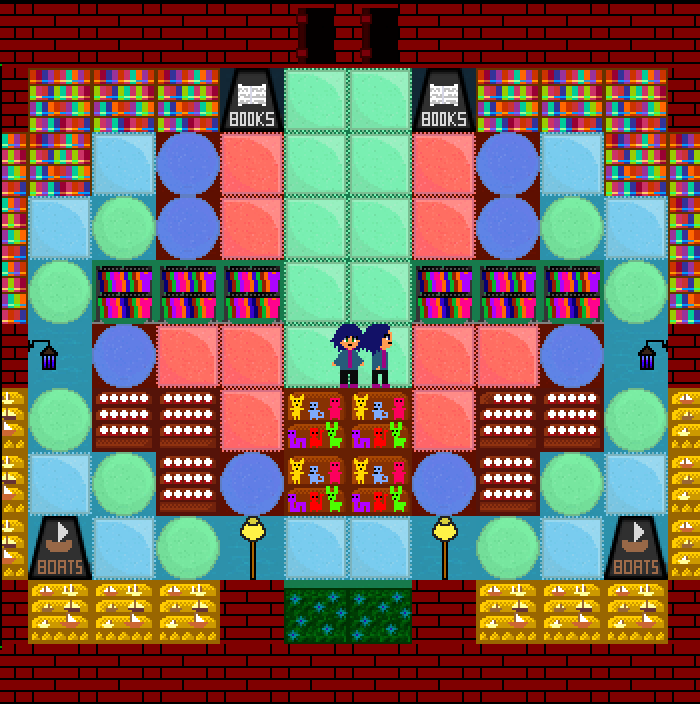 Each stage has its own red coin collecting challenge, while you try to take down unique opponents in hazardous environments. Keep an eye out for Steam Early Access coming up next month! Gambrinus is on a quest to bring back MUDs with new flare, and to start his journey, he has created Everheart, The game has all the basic systems of a text-based RPG: navigation, social features, combat features, and UIs. As he mentions on the website, he has also implemented a C-style scripting language, allowing him to update some aspects of his game on the fly without reloading the world. Everheart is currently looking for alpha testers and can be applied for in-game. User interfaces are starting to shape up in Kage: Rise of the Tengu. Avidanimefan shows us his progress on inventory management, crafting, and stat sheets. 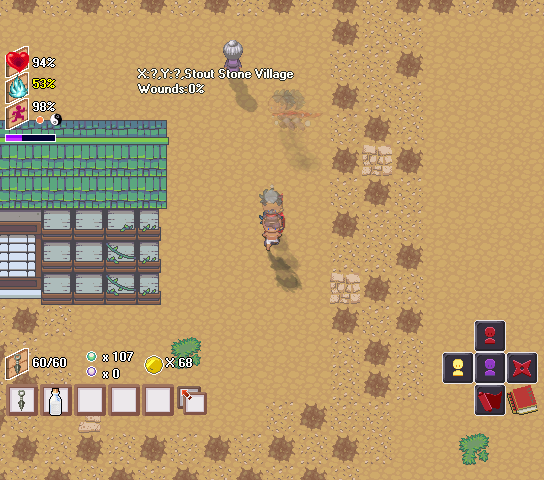 Ninpo hotslots have been replaced with a system of key press combinations, skill building and crafting recipes have been added, and roleplaying features have begun finding their way back into the game. Jobs are getting more competitive on Main Street, as Foogimicester has added NPC peons to the roster of potential employees. While they may not be able to build and expand your retail empire, they can keep everything up to snuff while you're away. HUD elements have also been added for the commands related to shop expenses. A list of exciting upcoming features has been provided in his dev-log as well, so check it out! Getting hung up on that narrow doorway while using pixel movement? Woo shares a solution for nudging though the gap. Do you really like the new smudging effects in Feed? Do you wish you could add the effect to your game? Your wish has been granted by Kumorii! 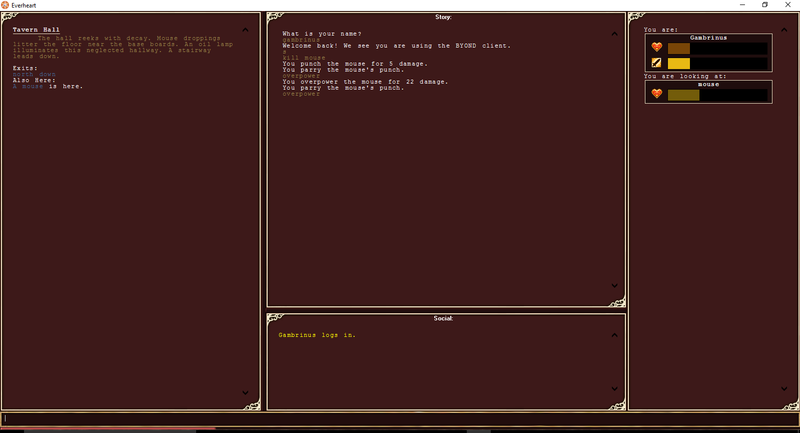 Woo shares Mouse Movement, a library for moving the player while holding the right mouse button. Flip flopping bits? Lummox JR shares one way to accomplish the task and ways that it can be practically applied. I think I'd like these to be weekly. They are quite interesting. What image from your game would you like me to use? I used the default orange BYOND logo as that is the default graphic used when a hub page is created without specifying a hub icon. To the best of my knowledge, there is no hub page in which I can link to your game or pull hub graphics from. My knowledge is limited the the information you share about your game in the SHOW ME WHAT YOU GOT thread, the majority of which are done in .gif format, which is an awesome way to showcase your game. Generally, I only included images that represent a single image (.png, .jpeg, etc). My hesitation in including .gif graphics with this post is three-fold: 1) I find that it is too difficult to see what is happening when the .gif is reduced to a height of 64 pixels. 2) .gifs tend to load slowly due to the higher amount of information. 3) I ultimately find them to be distracting given the format of this post. I do try to avoid using outdated imagery where I can, often using the developer’s BYOND membership icon as a fall-back, if available. I try to work with what I can find. I'm just kidding, I'm not 100% mad, maybe 2% only. I understand your position. Guard this secret, the name of the game will be PIRATE DENSHOU.